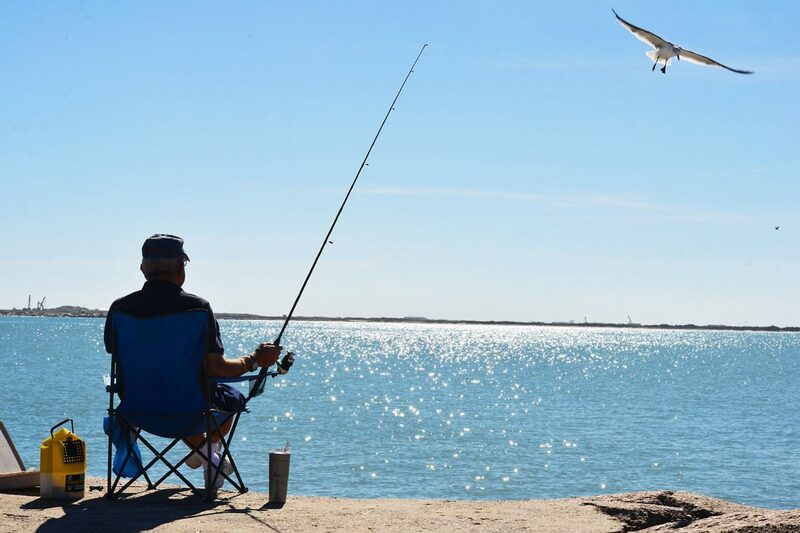 A man enjoys a day of fishing along the jetties at Isla Blanca Park on South Padre Island Tuesday afternoon as SPI considers to be a future destination for cruise liners. A preliminary study from SPI Cruise Group, a consortium of cruise industry experts evaluating South Padre Island’s potential as a port of call, concludes that the Island is, in fact, well-positioned to attract cruise ships. If it comes to pass, the Island will be the first new U.S. port of call in half a century, according to the group, which is exploring the feasibility issue at the behest of SPI’s leadership. The analysis, based on a December site visit by the group, is divided into four categories: maritime viability, uniqueness and branding, consumer demand, and revenue possibilities. An initial “desktop study” of meteorological and oceanographic data showed that the Island offers safe harbor conditions shielded from prevailing wind and waves. Cruise ships would enter through the jetties of the Brazos Santiago Pass and dock bayside. The study identifies three potential berthing locations requiring various levels of dredging and says that, in light of the county’s redevelopment of Isla Blanca Park, cruise passenger reception facilities should be “limited and temporary” to minimize environmental impact as well as cost. The ideal berthing location would lend itself to a number of pier configurations, with a relatively small environmental footprint and minimal dredging required, the study concludes. The uniqueness-and-branding category includes “tropical adventures” SPI Group thinks would appeal to cruise passengers — things like kiteboarding, deep-sea fishing, dolphin watching, scuba diving and horseback riding, all available within five miles of a docked cruise ship. The study also identifies eco-tourism as a big draw, including the South Padre Island Birding & Nature Center and Sea Turtle Inc, as well as the Island’s value as a historical destination with a recorded history going back to the early 16th century. “Heritage tours could be created starting with the Native American story through the colonial era, including shipwreck maps and trips to the 1830s-era lighthouse at Port Isabel,” reads the report. As for consumer demand, the Island already gets 4.5 million visitors per year, the study points out. With request for information about the Island through online and print advertising coming from around the country — especially from the Northeast, the Great Lakes region, California and Florida — consumer interest is national in scope, according to SPI Cruise Group. “Overlaying that map with a map of cruise-guest feeder markets showed significant overlap, indicating that interest in SPI as a vacation destination could relatively easily be developed into interest in the Island as a cruise port of call,” reads the report. The study notes that availability of “shore excursion opportunities” near a port of call is what attracts cruise lines, and that the Island features a “diversified and mature tourism infrastructure” with a number of potential shore tours of which cruise passengers on a day trip could take advantage. Based on the study, SPI Cruise Group has concluded that the Island possesses all the qualities necessary to support cruise tourism as a port of call. Jay Lewis, the group’s project leader and managing director of Miami, Fla.-based MarketScope Global, said the Island would be the first new U.S. cruise port since Key West got its inaugural cruise ship in 1969. “It takes a very specific combination of attributes for a place to qualify as a cruise port of call,” he said. Lewis said a marketing campaign is “underway and moving smartly” in advance of next month’s Seatrade Global Cruise Conference in Fort Lauderdale. “We’ll be meeting with some cruise executives there, and we’ll be extolling the virtues of South Padre Island,” he said. While the initial study turned up no red flags, the process of examining the Island’s feasibility as a port of call is still in the early stages, Lewis cautioned.